Please note that the TimeRef website is currently being redesigned. The first castle to be built at Warwick was a motte and bailey castle. The motte being built on the western side of the bailey. A fantastic castle to visit. Highlights for me are the walk around the ramparts and to the top of the tower. Climb to the top of the motte for an excellent view of the surrounding landscape and Warwick town centre. Peacocks and ducks roam freely in the large immaculately kept grounds where, in my experience, I've found that the grass is replaced annually! Can be expensive so best to go on a day when there are extra events taking place. These usually happen during the major bank holidays and during the school holidays. Highlights during these times are the birds of pray show in the summer months, the trebuchet and jousting shows. Some static attractions are open annually and be aware that some attractions cost extra. To keep the kids happy there is normally a face painting tent and have-a-go archery areas. I would like to give Warwick Castle 5 stars but I find it too clinical like a theme park. If I were the owners I'd build a mock medieval village somewhere in the grounds. arwick Castle was built by Henry de Beaumont (or Newburgh) on the orders of William the Conqueror in 1068 as part of a defensive chain of castles established to maintain power in his new territories. Henry was given the title of Earl of Warwick. It is possible that some kind of defensive structure existed on the site in the early tenth century or before belonging to Ethelfleda, the daughter of Alfred the Great. Ethelfleda had fortified the town of Warwick making it an important and prosperous place to live. The first castle built by the Normans at Warwick was a motte and bailey castle consisting of a huge mound of earth topped with a wooden fort and to the east of the mound a bailey surrounded by a ditch and wooden palisade. The castle was positioned by the side of the River Avon on an outcrop of rock which gave protection to the castle on that side. The Beaumont family lasted for five or six generations. and it was during this period that the wooden structure on top of the mound was replaced by a stone shell keep. This keep was removed and can now no longer be seen. The wooden palisade around the bailey was probably replaced by stone walls at the same time. Thomas Beaumont died in 1242 without an heir so the castle became the property of his sister Margaret. Margaret married John du Plessis who then became the new Earl of Warwick. John and Margaret did not have any children to pass the castle down to so it went to William Mauduit, Margaret's newphew. It was during William's ownership of the castle and during the Baron's War that Simon de Montfort's forces attacked the castle and kidnapped the Earl and his wife. 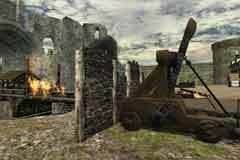 The castle suffered a lot of damage during the attack. William was released after paying a ransom but died shortly afterwards. The castle then went to his sister's son, William de Beauchamp. The Beauchamp family was to own the castle for almost 200 years. After the attack during the Baron's War the castle needed rebuilding and the Beauchamps did that. In the late fourteenth century several major changes were made to the castle including the great hall and domestic ranges, a water gate, improvements to the main gatehouse and the barbican in front of it. Two Beauchamp Earls were called Thomas. Each one was responsible for one of the large towers that were erected on the outer wall. Caesar's Tower came first followed by Guy's Tower. 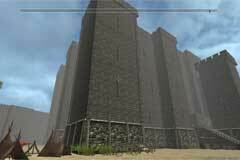 Both towers are much taller than the outer walls. Guy's Tower is 128 feet high and was named after an earlier Earl of Warwick, Guy de Beauchamp. Caesar's Tower is even taller at 147 feet high. The last member of the Beauchamp family to own Warwick Castle was Henry Beauchamp who was the first to be given the title Duke of Warwick. Henry died in his early twenties in 1446 and the castle passed into the hands of his sister Anne Beauchamp who married Richard Neville, 'The Kingmaker'. Richard Neville, the 'Kingmaker' was one of the most powerful men of his time. He fought alongside Edward IV and the house of York during the Wars of the Roses against Henry VI. In the end Richard and Edward became enemies and in 1471 the Kingmaker was killed at the battle of Barnet. After Richard's death the castle passed into the hands of George Plantagenet, Duke of Clarence as he had married Richard Neville's eldest daughter. George was executed in 1478 and the castle passed to his young son Edward. As a potential heir to the English throne Edward was arrested and placed in prison and later executed. 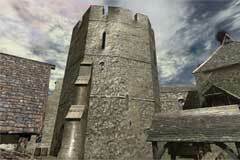 At this point the castle became royal property during the reigns of both Henry VII and Henry VIII. Over the centuries the castle became an important seat of power and was the home for the Earls of Warwick who played an important role in shaping the history of England. Richard Neville, Earl of Warwick was known as the 'Kingmaker' for his involvement in bringing Edward IV to the throne. The castle is possibly the best castle to visit in Britain due to the wide range of events and attractions that can be seen. 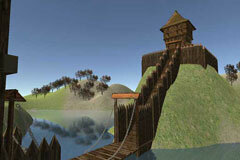 If you are using Edge, Chrome or Firefox browsers please take time to explore a virtual motte and bailey castle. There are two versions available, a simplified version for slower computers and a more detailed version for faster computers. Below are a couple of simplified reconstructions of Warwick Castle showing stages in its development from a motte and baliey castle built from wood in one built from stone. Athelflaed, the Lady of the Mercians, founded the town of Warwick at the important river crossing across the River Avon. The town was fortified againt attack from the Danes. William the Conqueror ordered the building of Warwick Castle. The earldom of Warwick was created by William II and given to Henry de Beaumont. Henry de Beaumont changed his name to Newburgh. Roger de Newburgh became the second Earl of Warwick. The castle at Warwick was attacked by forces loyal to Simon de Montfort. The castle was badly damaged in the assault. The Earl of Pembroke with his captive Gaveston, stopped at Deddington for the night. Pembroke left Gaveston to attend to other matters. The Earl of Warwick took advantage of Pembroke's absence and took Gaveston from his bed. They went to Warwick Castle and Gaveston was thrown in the dungeon. The four Earls, Lancaster, Warwick, Arundel and Hereford took the decision that Gaveston should be punished and took him to Blacklow Hill where he was executed. As Gaveston was under excommunication, the body was not buried straight away. The construction of the huge circular tower called Guy's Tower at Warwick Castle was completed. Richard Neville married Anne Beauchamp who was the heiress to the Warwick Earldom. The last male Beauchamp had died without an heir and so Richard took the title of earl of Warwick. This gave him control of large amounts of land in the Midlands and South Wales. While Edward was imprisoned, Warwick captured the Queen's father (Earl Rivers) and one of her brothers and had them executed at Warwick Castle. View this page on a desktop computer to explore a virtual UK landscape. 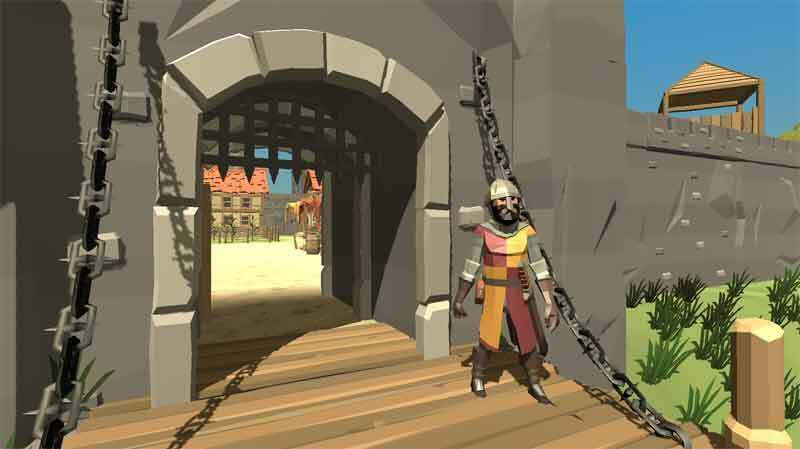 This Android app allows you to find castles thar are near you. 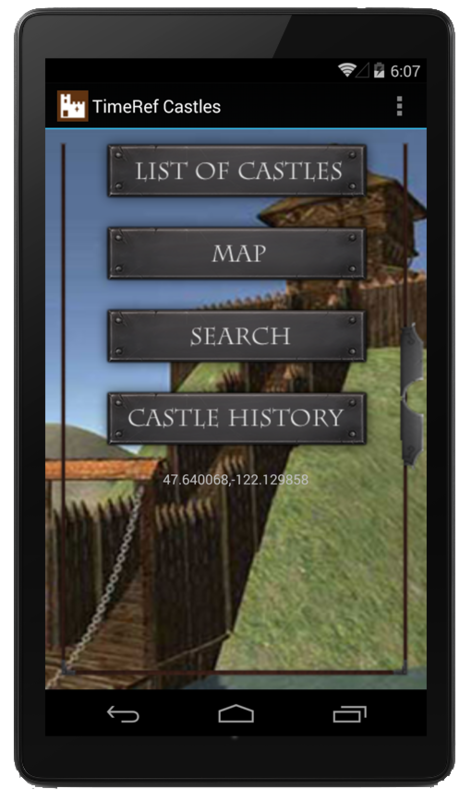 Currently the app includes only English and Welsh castles. Transport yourself back up to a thousand years and explore historical buildings as they may have appeared in the past.